In this week’s issue… Buffalo broadcasters dig out – Disney sell-off underway – Evanov adds in Montreal – Stevens buys in PA – A thaw for WARM? Power and internet stayed on for most customers, even in the hardest-hit areas, and so broadcasters didn’t have this storm all to themselves. 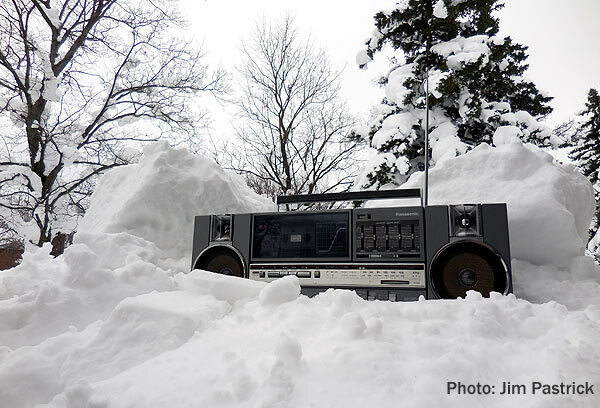 Unlike 1977, when battery-powered radios were the only lifeline for many Buffalonians, this storm was as much a TV event and a social-media event, with many of the most dramatic pictures from the snow zone flowing from Facebook and Twitter to TV stations that couldn’t get crews into the worst-hit areas. On TV, all three of the city’s newsrooms went wall-to-wall for much of the week, and after all the criticism third-place ABC affiliate WKBW-TV (Channel 7) drew over the summer for focusing its morning show primarily on weather and traffic, was this the story that proved new owner Scripps Howard made the right decision? While there are elements of the coverage today which make many of us crazy and shake our heads, this is the sort of day that the media performs a public service and saves lives. It might be a year or two of total BS stories, but if you can’t feel satisfied or accomplished on a day when you’re telling people not to drive because they could get stuck and die… to keep people who might be scared or lonely company… to show them the 4 feet in someone else’s yard while they have sunshine, and maybe stop them from bad decisions… Then I don’t know why the hell anyone would do this, save a pay check. And I can think of all kinds of easier ways to make a buck than this. And that brings us to a few words about preparation: as our colleague Howard Price, ABC’s director of business continuity, constantly preaches, you can never be too prepared for an emergency like this one. Even if you’re not in an area that routinely sees as much bad weather as Buffalo, does your station have plans for housing and feeding essential staffers if they can’t get back and forth to their homes? How will those staffers’ families be taken care of if staff members can’t get home? Do you have contacts in law enforcement to ensure that your news crews can legally be out on the streets even if a driving ban is imposed, as it was in much of the Buffalo area? And if they are, can they get fuel if gas stations are closed? (That turned out to be a very big issue for stations in New York City during Hurricane Sandy’s aftermath.) In an era when less and less equipment is repaired on site, because you can always get a replacement module shipped in overnight, what happens when something breaks and shipping is cut off for days on end? Or when the fuel tank for the generator starts running low and the road to the transmitter site is under 7 feet of snow? This story is far from over: with warm temperatures in today’s forecast, the next chapters will involve massive, speedy melting of all of that snow, and that means the already exhausted news staffs at Buffalo’s stations will have another busy week ahead of flood and evacuation coverage. CLASSIFIED ADS – Place yours today by contacting Lisa! *The new Tower Site Calendar is here! 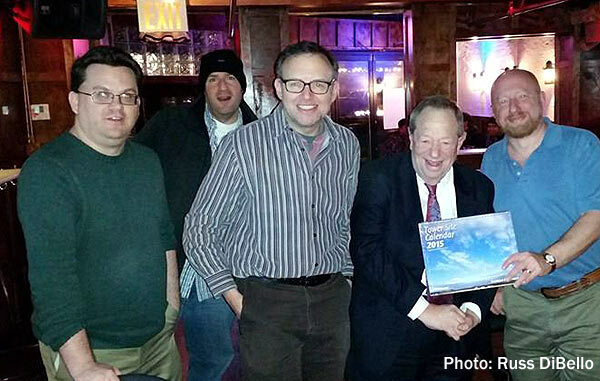 And not only is it now shipping from the Fybush.com Store, it was the star of the show last week in New York City, where yours truly (at the right) was happy to get together with a whole bunch of radio folks to launch this year’s edition in the world’s media capital. That’s RadioInsight’s Lance Venta, Z100’s JJ Kincaid, Sean Ross and Clark Smidt at our launch get-together….and keep an eye on this space for announcements of more Calendar events to come. We’re also now previewing the new calendar every Wednesday at fybush.com – check out this week’s feature here! *How many low-power FM stations will emerge from the filing window that’s just ended at the FCC? That may not be the million-dollar question, given the tiny budgets of many would-be LPFM operators, but it’s at least a question that’s a little easier to answer now that the FCC has released all the applications it received during the window. Nationwide, that’s about 2,800 applications, a significantly smaller number than many LPFM gurus were expecting. With the help of our content partners at Radio Insight and The Archives @ BostonRadio.org, we’ve compiled all those applications into a single searchable page that we published over the weekend. *In MASSACHUSETTS, Christopher Lydon has never exactly been “off the air” in the dozen years since he lost his daily slot hosting “The Connection” on WBUR-FM (90.9 Boston), but the veteran broadcaster has had his ups and downs as he’s attempted to stay visible through podcasting and through partnerships with WGBH (89.7) and Lowell’s WUML (91.5). Whatever hard feelings might have remained from Lydon’s 2001 split with then-WBUR GM Jane Christo have apparently healed: last week, WBUR announced that Lydon and his longtime producer Mary McGrath will bring their “Open Source” to the WBUR airwaves once a week beginning in January. The show will air Thursday nights from 9-1o, in a slot now filled by “The Moth Radio Hour”; it will also repeat on the weekends. Lydon’s first stint with WBUR began in 1994 after his former home, WGBH-TV, cancelled the nightly newscast he’d been anchoring. Back in Lydon’s first stint at WGBH, most of the station’s news efforts were focused on the TV side of things, but these days the big news push is down the hall at WGBH (89.7), which just added two more news staffers last week. Deb Daigle, who’s worked at WBZ (1030), WRKO (680), Unistar Radio and in Worcester, takes over from Jordan Weinstein as local anchor during “All Things Considered” from 4-7 PM. That moves Weinstein to midday news anchor and former midday anchor Cristina Quinn into a reporting role. WGBH’s other new hire is Rupa Shenoy, who’s working for a new partnership between WGBH and the New England Center for Investigative Reporting, which is now operating out of the WGBH newsroom. *What’s next for NEW YORK‘s WABC (770) once the Cumulus talker loses longtime staple Rush Limbaugh to Clear Channel’s WOR (710) in just over a month? The answer appears to include “more local talk,” in the form of a new local version of Geraldo Rivera’s midmorning show. Starting in January, Geraldo’s national show will return to its original New York-only status on WABC from 10 AM until noon, which means we’re still waiting for the big announcement about what will fill Limbaugh’s noon-3 timeslot in 2014, bridging the gap between Rivera and Michael Savage’s new 3-6 PM slot. *The FCC’s AM Auction 84 will include a new signal on AM 1700 in Rockland County, resolving a mutually-exclusive group of four applications filed during a special window the Commission opened in 2007. This is the only piece of Auction 84 that doesn’t involve the 2004 window; instead, these applications were the result of political pressure on the FCC to give Rockland a full-time local AM voice, ostensibly to address public safety concerns from the nearby Indian Point nuclear plant. The four applicants are S&B Broadcasting (for Stony Point), Talkline Communications (Monsey), Polnet Communications (Haverstraw) and Alexander Broadcasting (Ramapo), which started the process when it applied for an upgrade to its existing WRCR (1300 Spring Valley). Whichever parties are still interested in bidding next May will start with a $10,000 bid for the new signal, which will run 10,000 watts day, 1000 watts at night. *Remember how we noted at the start of this week’s column how challenging it can be to run a small community noncommercial FM? That challenge is playing out in real life up in the Catskills, where WIOX (91.3 Roxbury) is changing hands. The small signal has belonged to the Town of Roxbury since its 2010 debut, and it’s built an impressive crew of community programmers who’ve kept it going with local shows in the tiny town of just 2,500 people. Along the way, WIOX partnered up with Binghamton’s WSKG (89.3), which has been providing overnight classical programming and technical assistance to the station – and will now take over ownership of the license. WSKG will pay just a dollar for the WIOX license, but in exchange it will continue to maintain a local studio in Roxbury for at least three years and will work to move the station’s tower to a better location than the current site at the town highway garage. *The week’s big story from western PENNSYLVANIA, by far, came from Clear Channel talker WPGB (104.7 Pittsburgh), which started the week rather prominently cutting ties with longtime morning stars Jim Quinn and Rose Somma Tennent. Their “War Room” talk show had been a staple on the station since it launched the talk format in 2004, but on Monday morning listeners to WPGB and a handful of “War Room” affiliates around the region instead heard “Bloomdaddy,” the equally conservative morning host at Clear Channel sister station WWVA (1170) in Wheeling, West Virginia. At one time, Quinn and Rose were on as many as 18 affiliates, but their NERW-land reach was down to just two affiliates that we can track: in Olean, WVTT (96.7 Portville) carried the “War Room” from 9-noon daily, while Rochester-market WYSL (1040 Avon/92.1 W221CL Rochester) carried them in morning drive and is now running Bill Bennett’s “Morning in America” while hoping to bring Quinn and Rose back to the airwaves. A pioneering figure in RHODE ISLAND broadcasting has died. Art Lake came to Providence’s WJAR radio (920, now WHJJ) in April 1944 as an announcer, putting him in position to be part of the on-air team that launched WJAR-TV (Channel 11, now 10) in 1949. In the station’s early days, Lake (like most announcers of the era) did a little bit of everything, reading newscasts, hosting entertainment shows, working the announce booth. But he quickly specialized in one area: weather forecasting. For decades, Lake was the weather in southern New England, delivering forecasts on WJAR-TV’s evening news and, starting in 1985, the station’s morning show. Lake went into semi-retirement a decade ago, though he returned to WJAR for his 60th anniversary with the station in 2004 and continued to read birthday announcements on WJAR’s “Sunrise Show” until health problems forced him to retire for good in 2006. Lake died early Sunday morning, at age 85. In MASSACHUSETTS, we know a little more about what’s in store for listeners at WGBH (89.7 Boston) and WCRB (99.5 Lowell) when the former takes over operation of the latter just a week from tomorrow. The new “All Classical 99.5” will retain several familiar voices from the WCRB staff, including Laura Carlo in morning drive and Ray Brown in afternoons. WGBH’s Cathy Fuller will handle midday duties on weekdays, and at least for now, it appears the station will be automated from 6 PM until 5 AM. WGBH’s Brian McCreath will provide a local voice on Saturday and Sunday mornings, followed at 11 AM on Saturdays by the syndicated “At the Top” show, also heard at 5 PM Sundays. Saturday nights will continue to be the home of the Boston Symphony Orchestra, a WCRB staple. It also appears that WCRB’s classical programming will replace the WGBH feed on WNCK (89.5 Nantucket); there’s no word yet whether there will be a similar flip for WGBH’s Beacon Hill translator, W242AA (96.3). There’s also not much yet to report about a new schedule for 89.7 – and indeed, it appears WGBH has not yet finalized the news/talk lineup that will replace daytime classical and the weekend folk and blues shows that go away next weekend. A live clearance for NPR’s Diane Rehm show (currently heard in Boston only for one hout late at night on WBUR) seems likely for the late-morning hours, but the rest of the day appears to be in flux so far; expect a more definite schedule next week. There’s an interesting translator development in upstate New York – Geneva and Seneca Falls, to be exact, where the Finger Lakes Radio Group is trading away 1000-watt daytimer WSFW (1110 Seneca Falls) to Calvary Chapel of Twin Falls in exchange for translator W214BR (90.7 Geneva). When the deal closes, Calvary will get much broader coverage of the northern Finger Lakes (and a long-term sweetheart lease deal on the WSFW transmitter site) – and Alan Bishop and George Kimble will take ownership of the translator that already operates from the tower of their WGVA (1240 Geneva). With a move to the commercial part of the FM dial, W214BR will presumably begin relaying WGVA, just as Finger Lakes already does with FM translators for its other AM signals in the region. WSFW’s current visitor-information programming will likely go away when the AM signal becomes a Calvary religious outlet. A venerable PENNSYLVANIA TV personality is calling it quits. Dave Roberts, who’s spent 31 years doing weather at Philadelphia’s WPVI-TV (Channel 6), announced last week that he’ll retire next month after one last stint as co-host of the station’s Thanksgiving Day parade and a few more weeks doing weather. Roberts’ last day at the weather desk will be December 11, capping a 56-year career that began in his student days at Syracuse University’s WAER (88.3), where he went on the air back in 1954. As “Dave Thomas,” Roberts became a fixture on the Buffalo broadcast scene, working at the old WBUF-TV (Channel 17) and then, after a few years in the Army working for AFRTS, at WKBW-TV (Channel 7). Beginning in 1961, he was an iconic part of the Channel 7 team, hosting “Rocketship 7” and “Dialing for Dollars” and doing the weather on “Eyewitness News” alongside the legendary Irv Weinstein. Under owner Cap Cities, many popular WKBW personalities found their way to Philadelphia and then-sister station WPVI, and Roberts was no exception, making the move in 1978, initially as host of “AM Philadelphia,” then taking over weather duties in 1983 after the skydiving accident that claimed the life of Jim O’Brien. A longtime CONNECTICUT station owner has died. Daniel W. Kops, Sr. moved from the newspaper business in Harrisburg, Pennsylvania to the radio business in New Haven after World War II, where he became a partner in WAVZ (1300), forming Kops-Monahan Communications. That station group expanded in time to include WKCI (101.3 Hamden), as well as WTRY/WDKC-FM in Albany, New York, and while the Albany stations were sold in 1972, Kops-Monahan remained in business in New Haven until the mid-80s. Kops, a Cornell University graduate, served on the NAB board and the board of the National United Way Association. He’d retired to Palm Beach, Florida, but returned to Connecticut, where he died Nov. 14 at the Connecticut Hospice in Branford, at age 92. It’s becoming increasingly clear that there are no winners in the scandal that’s had the attention of most of MASSACHUSETTS for the last week or so – and certainly not the staff or listeners at WBIX (1060 Natick), where afternoon host Mark Mills admitted on the air late last week that the people putting together the station’s business format weren’t getting paid and expected to be sent packing any minute. Mills’ announcement actually came a day before Chris Egan, the EMC heir who had been planning to buy the station from self-confessed swindler Brad Bleidt, said he was pulling out of the deal. Egan said that his withdrawal from the deal would cost him somewhere in the six figures, but that allowing the station to go through a court-ordered receivership sale would be more likely to put at least some cash back in the pockets of the clients Bleidt defrauded before attempting to kill himself. Bleidt, meanwhile, ended the week under arrest on federal mail-fraud charges, two days after he checked himself in to the psychiatric ward of Massachusetts General Hospital. The inevitable question: what now for 1060? With Egan out of the picture, the station’s future now appears to be up to attorney David Vicinanzo, the court-designated receiver in the Bleidt case. At the head of the list of creditors, no doubt, will be Alex Langer, to whom Bleidt still owes at least seven million dollars for the WBIX license. (Bleidt paid more than $13 million for the station, most of it in the form of a loan from Langer.) But Bleidt’s accused of taking roughly $35 million from investors, and if WBIX is in fact the only significant asset that’s left from his activities, it will be up to Vicinanzo to determine how to wring the most cash he possibly can from the station. That, in turn, may mean not a continuation of the business format but rather an outright sale to another operator – and that, in turn, means there may not be much point to trying to continue the station’s operations under the current format. Several staffers are already gone from WBIX, including Mills’ afternoon producer, and the rest are expected to learn more about their fate this week. We’ll keep you posted. Our top story out of NEW YORK this week is the return of a very old set of call letters to the Rochester TV dial, as Clear Channel announced Friday that it will flip WOKR (Channel 13) to WHAM-TV in January 2005. The WHAM-TV calls belonged to Rochester’s original TV station, first on channel 6 and then on channel 5, from 1949 until 1956, when it and WHAM radio were sold to separate owners and the TV side became WROC-TV (which moved from channel 5 to channel 8 in 1962). WHAM (1180) and WOKR have been co-owned for several years now, and they’ve experimented with some newsgathering cooperation and cross-promotion since then. The big development in MASSACHUSETTS is the start of testing on WMEX (1060 Natick)’s new 40-kilowatt day signal, as confirmed to NERW by Alex Langer himself. Langer says the actual start of programming with the new signal is likely to be sometime in January, giving him the holidays to work out the kinks in the triplex with WKOX (1200 Framingham) and WJLT (650 Ashland). Bloomberg’s morning show has migrated from WXKS (1430 Everett) to WBNW (1120 Concord) and WPLM (1390 Plymouth), replacing the local business show there. WXKS returns to satellite standards in morning drive. Nothing doing in NEW HAMPSHIRE… but there’s plenty in MAINE, where Harron Communications will spend $11.8 million to buy the last locally-owned radio group in the Portland/Lewiston-Auburn area. Arnold Lerner’s Wireless Talking Machine Company owns standards trimulcast WLAM (870 Auburn)/WLAM-FM (106.7 North Windham)/WZOU (1470 Lewiston), country WTHT (107.5 Lewiston), and AC WMWX (99.9 Auburn). Harron owns WMTW-TV (Channel 8) in Poland Spring; combining the TV and radio properties will make it a much more potent force against the market’s TV operators (Gannett and Sinclair) and radio clusters (Citadel and Saga). Happy 75th anniversary to Bangor’s WABI (910), which marked the occasion Friday (11/19) with the help of veteran morning man George Hale and a special tribute on former sister station WABI-TV (Channel 5). Around the fringes: We see Buffalo’s old WLCE callsign popping up in Philadelphia, as WYXR (104.5) dumps “Star” for “Alice.” On the other end of the state, Clear Channel is swapping calls in New Castle, north of Pittsburgh, as WBZY’s talk format moves to 1280 from 1200, while WKST’s oldies go from 1280 to 1200. Clear Channel’s also swapping calls and formats in the Youngstown market, where the WRTK calls that were once in Rochester move from 1390 to 1540 in Niles, Ohio, while the WNIO calls from Niles move to Youngstown and 1390.